This week fashion designer Shannon Williams of Sunrise Studios and I sat down with Shelley Irwin and talked about the crossover of fashion and interior design, oh how we love the mix! Shelley asked us great questions on starting a makeover in your home or wardrobe, and creating your own personal look. Once we get started talking design it’s hard to stop! It is so fun to explore the most personal ways we can express our selves, and dare to be comfortable in our own skin no matter what others think! If you missed the interview listen here or watch facebook live here . One area we talked about during the interview was inspiration, and where to get it! I want to share a bit about how I use inspiration in a real and practical way! First, you must have a holding place for inspiration that you can easily get to and use. This could be a notebook, binder, or the computer. My favorite way to save ideas is Pinterest and magazine files. I have a mix of public and private boards on Pinterest depending on how they are being used. For example, client boards might not be public if they are very product specific. I also have private boards that relate to goals, my family or anything that is more information based and not necessarily “pretty.” I use the magazine files for images I tear out of magazines, I love having them loose and easy to grab. I still LOVE reading design books and magazines even with all the online content out there! My Fashion Pinterest page is easy to pull from and share, I love using it for making collages! I save images that inspire me personally, outside of design work, and I also save images that are inspired by my clients. I look for interesting color combinations and lots of texture. Here are some examples of HOW these images translated to design. This Chanel dress from Autumn/Winter 2014 was a beautiful inspiration for my clients guest bedroom. The subtle mix of purple, gold and cream is delicious and fit my clients personality perfectly! Oh the texture of this beaded jacket is a dream! This jacket is also Chanel and it made me think of my client instantly, so I saved it to her file. 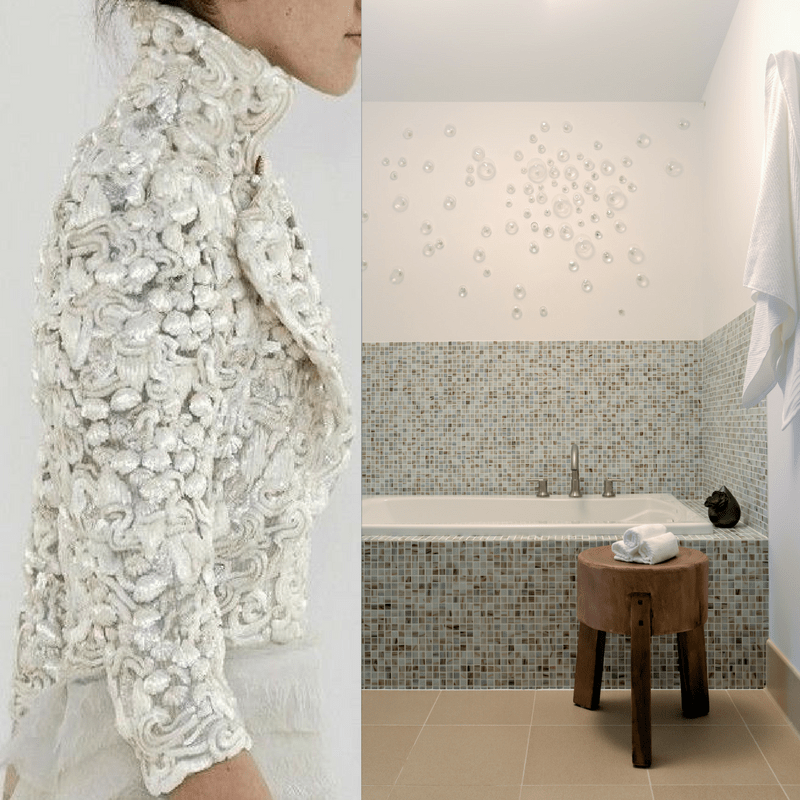 The soft and subtle white, cream, and glass were inspired this bath with mosaic glass tiles and bubble glass art created by Joe Sherry with LaFontsee Gallery. Inspiration can lead to infinite outcomes, this just happens to be one. How do you save inspiration? Do you go back to it and use it? I would love to know your methods!